Indigenous / Traditional knowledge is the knowledge that people in a given community have developed over time, and continue to develop. It is based on the experience, often tested over centuries of use, adapted to local culture and local environment, dynamic and changing. Indigenous knowledge is not confined to tribal groups or the original inhabitants of an area of any country. It is not even confined to rural people rather. Any community possesses indigenous knowledge, Rural or Urban. This is also called “Local Knowledge” and “Traditional Knowledge”. People have an intimate knowledge of many aspects of their surroundings and their daily lives. Over centuries people have learnt how to grow food and preserve and to survive in difficult environments. They know what varieties of crops to plant, when to sow and weed, which plants are poisonous, which can be used for control of diseases in plants, livestock and human beings. They know very well how to maintain the environment in harmony. Indigenous knowledge is a valuable and sophisticated knowledge system developed over generations by local communities in various parts of the world. This knowledge is validated over time in a way that is different to the western empirical system. A. People are familiar with indigenous practices and technologies. They can understand, handle, and maintain them better than introduced western practices and technologies. B. Indigenous Knowledge draws on local resources. People are less dependent on outside supplies, which can be costly, scarce and unavailable regularly. Indigenous Knowledge provides effective alternatives to western know – how. It gives local people and development workers extra options when designing projects. Instead of searching only among western technologies for feasible solutions, they can choose from indigenous knowledge or combine indigenous and western technology. Indigenous technologies and practices are often cheaper than western ones. They rely on locally available skills and materials and often require little or no cash outlay. 1. The main source of energy for the production of carbohydrates is the sun. Maximum utilization of sun energy is most important for agricultural production. 2. It is only green plants which can use sun energy to produce carbohydrates. The degree of utilization of sun energy is dependent on the quantity of green plants. 3. The source of fertility (minerals, humus etc.) is organic matter which contains micro-organisms. 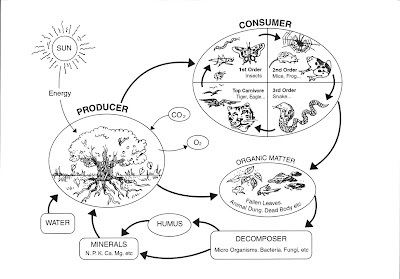 A supply of organic matter is indispensable for soil improvement through fertilization (manuring). 4. Every living thing interacts and there is nothing which is unnecessary and harmful in nature.